The Southwest ADA Center is a program of Independent Living Research Utilization (ILRU), at TIRR Memorial Hermann in Houston, Texas. The Center is funded by a grant (H133A110027) from the Department of Education's National Institute on Disability and Rehabilitation Research (NIDRR). NIDRR is not an enforcement agency. The information herein is intended solely as informal guidance and is neither a determination of your legal rights or responsibilities under the Americans with Disabilities Act (ADA), nor binding on any agency with enforcement responsibility under the ADA and other disability-related laws. The Center is funded by a grant (H133A110027) from the Department of Education's National Institute on Disability and Rehabilitation Research (NIDRR). The Great Lakes ADA Center's mission is to increase awareness and knowledge with the ultimate goal of achieving voluntary compliance with the Americans with Disabilities Act. This is accomplished within targeted audiences through provision of customized training, expert assistance, and dissemination of information developed by various sources, including the federal agencies responsible for enforcement of the ADA. We are not an enforcement or regulatory agency, but a helpful resource supporting the ADA's mission to "make it possible for everyone with a disability to live a life of freedom and equality." 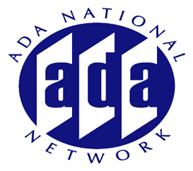 The Great Lakes ADA Center is a member of the ADA National Network which is comprised of 10 regional centers funded by the National Institute on Disability and Rehabilitation Research (NIDRR), a division of the U.S. Department of Education. The six states within the region served by the Center include: Illinois, Indiana, Michigan, Minnesota, Ohio, and Wisconsin. We have established ADA Affiliates in each state that represent the business community, government agencies, disability rights groups, and other interested parties. The Great Lakes Affiliates enhance the Center's mission of voluntary compliance of the ADA utilizing local resources to provide trainings, technical assistance, and engage in capacity building around the ADA in the state. The Great Lakes ADA Center is a program of the Department of Disability and Human Development under the College of Applied Health Sciences at the University of Illinois at Chicago. The Great Lakes ADA Center is funded under grant #H133A110029 from the U.S. Department of Education through the auspices of the National Institute on Disability and Rehabilitation Research (NIDRR).